and I lost a mentor and a good friend. 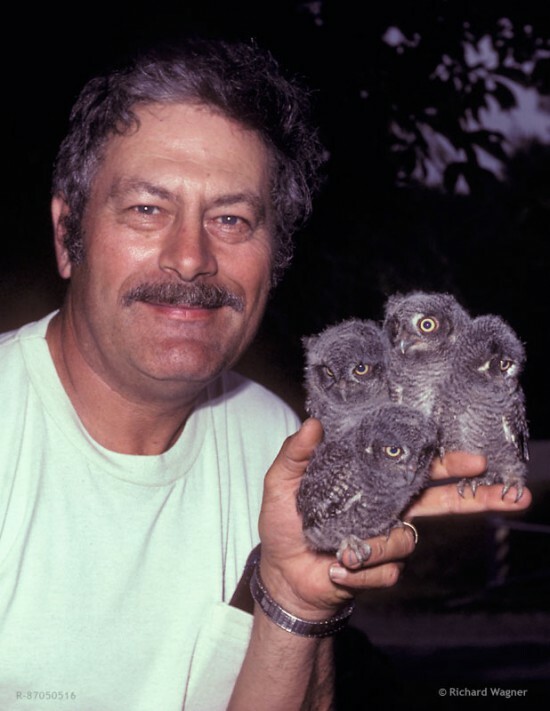 Ron Austing, May, 1987, holding four Eastern Screech Owl fledglings. Internationally renowned wildlife photographer Ron Austing died peacefully yesterday at the age of 82, with his daughters, son and close friends at his bedside, after a hard-fought battle with lymphoma. Ron Austing was born in Cincinnati, Ohio in 1931. His interest in wildlife began as a child, after his family moved to a suburb of Cincinnati called North College Hill. At the time, much of that small village was an undeveloped woodland, surrounded by small farms. This gave Ron the opportunity to observe nature relatively undisturbed. By the age of twelve he had become intimately associated with birds of prey: the hawks and owls, which initiated a lifelong passion with these birds. His other passion was baseball, and he spent several years working in the dugout of the Cincinnati Reds. He remained an avid Reds fan throughout his life. Ron’s desire to remain close to nature led to his career as a Park Ranger with the Hamilton County Park District in Ohio; essentially, the parks in and surrounding Cincinnati. In his thirty years with the Park District he saw the parks grow from some three thousand acres in 1953 to over sixteen thousand when he retired as a Park Ranger in 1983. After twenty-four years as a Park Ranger, with the rank of Captain, he became disenchanted with law enforcement and resigned, but he was immediately appointed to be the Park District’s first Wildlife Manager, a post he retained until he ultimately retired. In 1982, Ron was awarded the Ohio Conservation Achievement Award by the State of Ohio and the Department of Natural Resources. Beginning at a relatively young age, Ron combined his knowledge of wildlife with his skill as a photographer, and he became an internationally recognized wildlife photographer while in his teens. He published his first illustrated article while he was still in high school. Since then, his photos have appeared in literally thousands of publications, including National Geographic, Sports Illustrated, Audubon, National Wildlife, Ranger Rick, Birder’s World, Bird Watcher’s Digest, as well as countless other U.S and European publications. In addition to the many articles, books and field guides featuring his photography of birds, Ron authored several books of his own. He wrote his first book, I WENT TO THE WOODS: the Autobiography of a Bird Photographer, while he was still in his twenties. He followed with THE WORLD OF THE RED-TAILED HAWK and THE WORLD OF THE GREAT HORNED OWL. Birds were always Ron’s primary subject, especially birds of prey, Kirtland’s Warbler, neotropical migrants in general, as well as the nesting activities of a tremendous number of bird species. The more than fifty thousand transparencies, terabytes of digital files and hundreds of hours of video footage in his collection also include insects, mammals, reptiles, amphibians, trees, and flowers. The majority of subjects are representative of Eastern and Midwestern regions of the U.S., with some Western species and a limited number from the Canadian arctic, Ecuador and the Galapagos, Mexico, Africa and India. As the official photographer of the Cincinnati Zoo for many years, Ron’s photo collection includes controlled conditions or studio images of many internationally rare and endangered species. I met Ron 31 years ago in the Education Department of the Cincinnati Zoo. We spent many wonderful years together working on wildlife photography projects in the U.S. and Canada. Ron was my Best Man at my wedding, and I was at his bedside when he died. A small sample of Ron’s work can be viewed on our website here and is available for licensing. I plan to provide a much larger selection of Ron’s work in the near future, and I will assist his family in keeping his photographic legacy alive. You can view more of Ron’s work on the website that he used for photographic print sales: www.RonAusting.com. An open gathering for family and friends will be held on Monday, June 30 from 5 pm until the time of the Memorial Service at 8 pm in the High Plains Shelter at the Miami-Whitewater Forest. Today is August 20, 2014. I have just learned of Ron’s passing and I feel terrible about it. We did everything together for a time while growing up. And we’ve kept in touch over the years. Since I had not heard from him lately, I sent him an email yesterday. I was feeling concerned. When Don Schmidt emailed me and asked if I had heard from Ron, I started looking into it. It is very hard to think we will not be communicating with each other anymore. I have kept some good letters and photos he sent me and they will now be even more treasured. I do not know you, Rich, but thanks so much for putting this information together. Thanks for adding your voice. I tried to reach as many people as I could who knew Ron, but as you can imagine, it was an impossible task to locate everyone. I also find it difficult to accept the fact that I can’t just call Ron up anymore like I used to. I recently shot some Screech Owl video that I know he would have enjoyed. I felt like there was no one to celebrate with. Life goes on, but it’s not the same… I’m pleased that you enjoyed the small online memorial that I put together. Thanks for the kind words. I was saddened to here of Ron’s passing, but I felt enriched to have known him. Over thirty years ago Ron was the leader of my Explorer Post over in Miami Whitewater. Not only was he a great photographer, but he showed us how to take care of the forest with wise land management. I’m greatly impressed with how vivid the colors and details are with the portfolio in the website. He showed great patience and will be missed. Thanks, Gordy. Yes, he will be missed… for a very long time. That was real nice Richard. Thank you. G Ronald or as I referred to him as “Captain” was a Neighbor and a friend but mostly a teacher. Often times a gruff o’l fart he was always willing to show and teach others about birds and other wildlife. He had an army of “gabboons” which is more politically correct than scaffolding slaves. We helped him build many a tower so he could get fantastic photos of bird nests. I helped build his photo barn and often times provided access to our captive animals or some nests found on our farm. In return he showed me the magic that he could create with his camera and video. It has always been my intent to name our Raptor Center ( built of flight cages in the shape of a huge Phoenix) in his honor. Once complete it will be the G RONALD AUSTING RAPTOR CENTER. There are some nice comments about Ron by Tim Gallagher on the Living Bird Facebook page. The world of nature lovers and friends of Ron lost a huge talent. He will be missed by us on sans souci a well. Very warm photograph, Rich, and a superb account of a wonderful life. His illness and passing are most unfortunate; no doubt he will be sorely missed by family, friends, associates and more broadly the wildlife photographic community. Best regards and my sympathy to his family.